Steal the show as you walk into the party wearing this exotic stone! 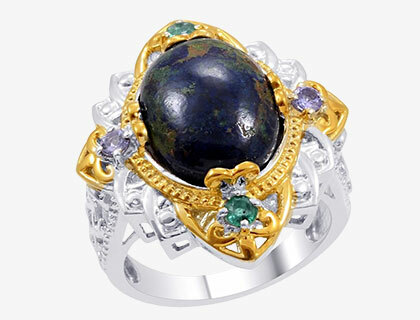 With deep and rich hues, Azurite contains copper green streaking on the encompassing azure-blue colour. Shop from the wide selection of Azurite-studded jewellery, only at TJC! Regarded as one of the most pious stones in the history, Azurite is known not only for its miraculous healing powers but also its stunning hues. Get sucked into the play of gorgeous colours transitioning at the surface of the stone, making it look almost alive! With the hypnotizing blue background, a heavy streaking of copper green colour steals the breath away. Getting its name from the Persian term for “distinctive, blue colour” – “lazhward,” azurite is considered to be a rare and precious stone. Coming from the family of basic copper carbonate minerals, it is often related with malachite. However, there’s a lot of difference between the two. Azurite is rarer than malachite, which makes it much expensive in comparison. One of the biggest supplies of the said stone was found in the suburbs of France, in close proximity to Lyon. It was initially called “chessylite” because it was of the Chessy origin. Since it has always been a soft stone, it is rarely used for jewellery and more by connoisseurs of rare gemstones of high value. The stone is also used for the manufacturing of pigments and textile dyes. A of now, you can find azurite across many locations in the world, like United States of America, China, Morocco, France, and Australia. While azurite is famed for its unique blue colour, it can also be found mixed with malachite for speckles and streaks of green. The stone is then a mix of blue and green colours, both of intense hues. Azurite has an opaque lustre in its natural occurrence. When it is polished, it is considered to be one of the most vitreous stones, with its colour and lustre matching malachite. There are very few varieties of transparent or translucent specimens. Because the stone is soft, it is rarely used for jewellery. If it used, it can only be found in cabochons. You can find several collectable items made of azurite, or beaded jewellery, as they include minimal cuts. The healers today believe in the legacy of powers that the stone boasts. It is a revered stone that eliminates stress and opens the mind for consideration of new prospects. Healers believe that the stone still brings psychic awareness and intuitive powers to the wearer. In fact, many astrologers use the stone as it acts as channel for your past or alternative lives. There are some healers who also use the stone to heal physical wounds. It is known to be used to fight liver and kidney diseases, it detoxifies the blood and organs, and is also regarded to stimulate brain and nerve activity. Students are advised to wear the stone as it opens the mind and guides in retaining all information, which comes in handy for exams. Azurite only rates 3.5 to 4 on the Mohs scale of hardness. Not only is it softer than other stones, it is also considered to “age” with time, meaning that if not taken proper care of, it will lose its colour and shape. Therefore, we provide you with proper care instructions so that your jewellery doesn’t wither over time. The first thing that you need to make a note of is that it is sensitive to prolonged exposure to heat and will fade away in long period of sun exposure. So, you shouldn’t wear it outdoors for a long time. If you need to clean your stone, use a soft cloth to wipe the surface. You may also use cool water and mild soap, too. It is also advisable not to wear the stone for any outdoor, sport-related activities. If you’re storing the stone, wrap it up in a soft cloth as it is susceptible to scratches and abrasions. The stone is called “Stone of Heaven” in Chinese lore as it is believed to open up gateways to celestial realms. It is also used to guide individuals who wish to venture into their past and alternative lives. Azurite ranks only 3.5 to 4 on the Mohs scale of hardness, which means that it is a considerably soft stone and very prone to scratches and abrasions. It is also recommended not to wear it in the sun as it loses its colour and shape over time. The stone shares its ore with malachite and is often found confused with the same. Azurite never goes any under kind of treatment and is one hundred percent naturally occurring.